1. Go to http://www.geocaching.com/my/, log in if needed. 2. From the menu on the right side of the page, under the Premium Features heading, click the Build Pocket Queries link. 3. Select the Create a new Query link at the top of the page. 4. Give your Query a unique name. I name mine Unfound Maine Caches followed by a number, 1 for the first one. 5. Important! Make sure all days of the week are not selected! 6. Choose how you want the PQ downloaded. Your choice, but I would not choose option 3. You'll want this PQ again. 7. Change the number of caches to 500 [Or 1000 for PQ1K PQs]. 8. Leave Any Type selected unless there are cache types you do not want to include. 9. Leave Any Container selected unless there are any containers you do not want to include. 10. On the next section, select the I haven't found and the I don't own options. If you are ignoring caches and would like to exclude them, you may do so here. Also, if you don't want to get disabled caches in your PQ, select the Is Active option. 11. Leave the Terrain and Difficulty sections unchecked unless you want to filter for either. 12. 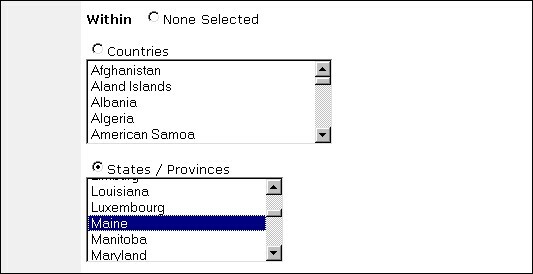 On the Within section, select the State button and scroll down to Maine and select that only. 13. Leave the From Origin set to None Selected. 14. This is the section we will be editing by trial and error so that we can produce just under 500 [Or 1000 for PQ1K PQs] caches. I always use the first day of a month as my starting date, and the last day of a month as my ending date. For our first query, we will use a starting date of January 1st, 2000, and an ending date of January 31st, 2005. We want to select a period of time here that does not exceed 500 [Or 1000 for PQ1K PQs] caches, but is close. Be careful selecting the ending day of a month - if, for instance, you select Sept. 31st, there will be an error since September only has 30 days. 15. Attributes to include/exclude can be left as is, unless you do not want to do certain caches. 16. The last few sections are personal preference, select as desired. If you are using the PQs for any data (GSAK, PDA, etc.) 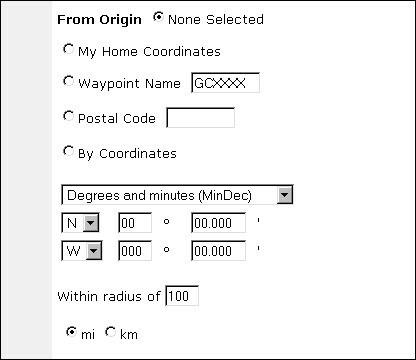 you must select GPS eXchange Format (*.GPX) format. 17. Click the Submit Information button. 18. At the top of the next page, it will tell you the total number of records the PQ will produce. With any luck, it is close to 500 [Or 1000 for PQ1K PQs], but not over. If it is not close to 500 [Or 1000 for PQ1K PQs] or over 500 [Or 1000 for PQ1K PQs], you will need to edit the dates and resubmit the PQ. If it wasn't close enough, edit the ending date to a later date, submit, and check the total again. If it was over 500 [Or 1000 for PQ1K PQs], edit the ending date to an earlier date, submit, and check the total again. Repeat this process until you are close to 500 [Or 1000 for PQ1K PQs] but not over. 19. That's it for the first PQ! You may select the dates you would like the PQ to run at this point if you would like to, though it is probably best to wait until you have created all the PQs. Also, it may help to jot down the dates you used for the query for reference in case you edit something wrong on the next. 20. Now it gets a bit easier. 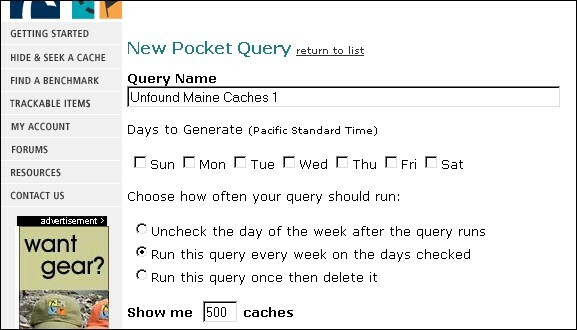 return to the Pocket Query list, http://www.geocaching.com/pocket/. 21. Click the Copy icon next to your newly created PQ, and click OK to confirm. It looks like a lightning bolt. This will create a new PQ named Copy of plus the name of the PQ you copied, in my case the name is Copy of Unfound Maine caches 1. 22. Click on your new PQ to edit it. 23. Edit the name accordingly. In my case, it is renamed to Unfound Maine caches 2. 24. Leave the rest of the PQ the way it is except for the dates. Edit the starting date so it is the day after the previous PQ's ending date. 25. Edit the ending date once again as you did in step 14 until you get just under 500 [Or 1000 for PQ1K PQs] caches. Submit, preview, edit, submit, preview until you get it just right. Once you get it, you may select the dates you would like the PQ to run if you would like to. 26. Repeat this process until you can reach the current date without the PQ exceeding 500 [Or 1000 for PQ1K PQs] caches. For this PQ I like to select the latest date the PQ generator will support (Dec 31st, 2010) so that the PQ will work until it exceeds 500 [Or 1000 for PQ1K PQs] caches. At that point you'll have to create another PQ. 27. Select the days of the week you would like each query to run if you have not done so already. Remember, Geocaching.com only allows 5 PQs per day, so if you have over 5 PQs to run you will have to split them up over two or more days. If you select the current day for any PQs to run, you should receive them very soon, but it may take ten or fifteen minutes. This process is very efficient, but should be edited with time since as you find more caches and other caches get archived you can stretch the time period for the PQ out a little further. thank you so much! i can see now where i was making my mistake and ending up with 3 notices of local caches! what a great tutorial, brdad! 250 miles should cover it all from your place, but that makes it irrelevant since you have allready selected Maine. It's like saying you want your closest cache as well as all caches within 5 miles - either way, you're going to get your closest cache. Some people get confused with the distance option - The radius is only factored in if a starting origin is selected. if you select None Selected, the distance will have no bearing on the outcome of the PQ. Never thought of that Dave. Thanks once again. thank you so much! I needed that. Yes this was a great tutorial..I pretty much knew how to create a pocket query but I didn't realize you could copy an existing PQ to use as a template for modifying it into a new PQ. I also didn't realize that you don't have to specify a distance in your PQ and that it will include all the caches in the state that you choose. Creating the queries by state and by date is a good idea. Then you can load all the individual PQ files into GSAK as one big database and save it as one file back to your synch folder. Thanks all for the nice comments. Glad it helped. Still getting "Memory is Full" error. ARGHHHHH!!! There are a few things that I would add. Because I did these things and they threw me a little. 1.) First add that you can only do 5 queries a day. 2.) After that you will get an error message that doesn't give any information. 3.) I also ran into a problem where the queries don't run right away. They can take 10 minutes or more before they show up in your mail. 4.) When you get the queries the way you want it you have to click on the day to run so you can get the zip file. 5.) This one really messed me up. After you down load the caches into your device. The Nuvi I have will only show the 50 closest caches. 6.) Another thing is that you can't just click on the caches in the query results and transfer them into gsak, because you will not get anything except the name of the cache and it's coordinates. BrDad you did a great job with this and I really appreciate it. I am just one of those that will run into problems no matter how easy you try to make it. If you unzip the PQ onto your desktop, then drag and drop the .GPX file onto the GSAK icon, everything is loaded into GSAK. Or am I not understanding the problem??? I think what he means is: if you preview the query and then download from the query page, you get a .loc file, not gpx file. The .loc file has much less info. in it. 1-2: That makes sense, I will add it soon. Back when I wrote this, 5 PQs carried the entire state. 3: I'll mention this briefly along with a refresher of the priority of PQs. 4: This is actually mentioned in step 20, but can use some revision - perhaps it's easier to just select the run dates for the PQs after they have all been created. 5: I don't think this is a PQ related issue. Perhaps someone should create an article for Nuvis. You will find most GPSrs, when listing the nearest waypoints only list a set number. 6: I am guessing tat is correct and you selected loc file, which has limited data. Perhaps I should stress the need for choosing GPX download, however. But as far as getting them from a preview page, if you choose the download waypoints option you will get a loc file, there is no option for GPX. The only way to get a GPX is by PQ or from each individual cache page. We met Ekidokai yesterday and he told us about this article... this is wonderful! Thank you so much for creating this resource brdad! Well thank you! I am glad you can make use of it. Another reminder I need to update it too! I have finally edited this article. It's a slightly simpler process now that the PQ page shows how many caches are included in the PQ after you submit it. I have also added most of Ekidokai's suggestions. If anyone feels I should clarify any other sections, or finds any errors let me know! This is somewhat related... it takes 11 PQ's to get all caches in Maine. I have them all e-mailed to me weekly and update my GSAK database with them. I used to manually load each zip file, which can be a bit of a pain. Today I thought to look it up and I see I was wasting a lot of time. If you download all of your PQ's to a single directory you can load them all in to GSAK at once. Go to File -> Load GPX/LOC/ZIP... -> Under Load Options remove the checkmark from "Use Defaults", then select "Folder" for Load Type. Now you can specify a path and it will load all zip files within that directory. You can also just tell GSAK to check your mail and get your PQs by itself! This works easier if you use a dedicated email address for your PQs, but can be done either way.